The following group types are not accepted by this hostel: Junior / Primary School, High / Secondary School, College / University, Stag/Hen/Bachelor Party, Sports Group If you have misrepresented the type of group you are booking for, your booking may be cancelled by the hostel." Our hostel is located in Gion area. Location is perfect for sightseeing. There are a lot of unique restaurants, shops, and cafes nearby! You can feel real Kyoto life. Our hostel is traditional Machiya style. 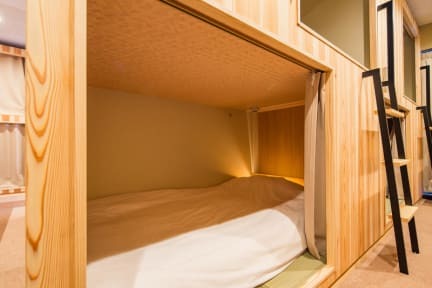 Ryokan Hostel Gion is offering accommodations in Kyoto. Offering a shared lounge, the property is located within a 4-minute walk. 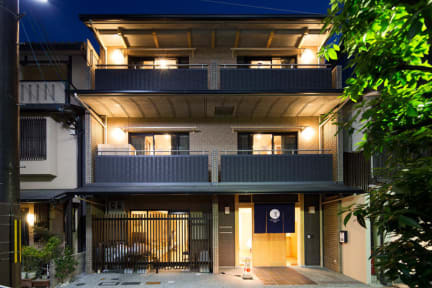 Located in the Higashiyama Ward district, the hostel is within 1.3 km of Heian Shrine. All rooms in the hostel are equipped with a electric tea pot. Certain rooms are equipped with a kitchenette with a microwave. All guest rooms will provide guests with a fridge. Speaking English, Japanese and Korean staff are ready to help around the clock at the reception. Best hostel ever. Clean, great service,as toothbrush and paste, towel and there s also a hydromassage bath. Position is really good, you are inside Gion Geisha district , close to Keihan metro station. You can finda a washingmachine and dryer as well. Beds are comfy but not really functional for a long holiday. Maybe, only thing, improve payment management, i paid like 2.000 yen more than what expected, 1.000 for kyoto's tax, and other 1.000 yen still don t know for what.